Orthodontics is an area of dentistry that focuses on the corrective treatment of crooked and misaligned teeth. At our Coburg clinic, we can provide orthodontics in Melbourne for children and adults alike who want to correct the position of their teeth. This includes conventional braces, internal lingual braces and clear braces. There are several reasons why braces for adults and children are beneficial. The main reason is that it’s much more difficult to clean crooked teeth, as they can overlap and cause obstructions that toothbrushes struggle to navigate. Braces make teeth easier to clean, reducing the risk of tooth decay and gum disease. Orthodontics can also improve the appearance of your smile, helping to increase self-confidence. Conventional Braces – Fixed to the front of the teeth, conventional braces are suitable for patients of all ages and are considered to be the most affordable braces. Internal Lingual Braces – These are fitted to the back of the teeth and can be more comfortable than other options. They’re also excellent for patients who want invisible braces. 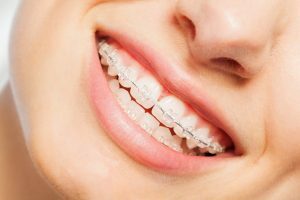 Clear Braces – Clear braces for adults and children are attached to the front of the teeth and are practically invisible. They’re made from ceramic materials that match the colour of the teeth. There’s no better choice than Apollo Family Dental when it comes to orthodontics in Melbourne. Contact us today to learn more about our available options for braces in Melbourne. Alternatively, you can make an appointment at your earliest convenience. © 2019 Apollo Family Dental. All right reserved.